We use TXP aluminum oxide polish in almost all of our rotary and vibratory polishing. It works great and is relatively inexpensive. What Is Aluminum Oxide Polish? Aluminum oxide has become the most popular polish for rock tumbling and most lapidary activities. Why? Two reasons: 1) aluminum oxide does a fantastic job at polishing agate, jasper, quartz, petrified wood and most of the other materials that are polished in a rock tumbler; and, 2) aluminum oxide polishes are inexpensive - they cost less than half as much as cerium and tin oxide - the other all-time favorite polishes. Aluminum oxide has a chemical composition of Al2O3 - the same as the mineral corundum. It also has a Mohs hardness of 9. TXP and #61 Rapid Polish are the two aluminum oxide polishes that we sell and the two that we use ourselves in all of our rock tumbling. 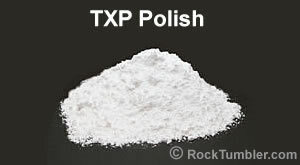 TXP is our best-selling rock tumbler polish and it is the polish that we use in almost all of our rock tumbling. We use it in rotary tumblers and vibratory tumblers. We use it for these reasons: 1) performance; 2) price; and, 3) particle size. Even though "TXP" means "the experimental polish" it has proven itself over many years of use. It is an aluminum oxide powder with a particle size distribution that centers around 3 microns. It makes a great lapidary polish and produces a bright shine on almost any rock, mineral or glass with a hardness between 5 and 8 on the Mohs hardness scale. We use TXP for its superior polishing abilities, but we also use it because of its particle size. That 3 micron size is large enough to keep it out of most of the tiny fractures and cleavage planes that exist in many tumbling roughs. We don't like to spend time trying to extract polish out of fractures! What is #61 Rapid Polish? Our second best-selling lapidary polish is #61 Rapid Polish. It has a particle size distribution that centers around 0.3 microns. It will work in a rotary tumbler but is primarily intended for use in a vibratory tumbler. That tiny particle size allows it to produce a brighter shine than TXP on some materials. Some people use a 1000 grit step before using Rapid Polish, but we have had great results going straight from 500 or 600 grit to Rapid Polish. Some history: #61 Rapid Polish was developed for polishing jade (a very tough stone to polish) in a vibratory tumbler. Rapid Polish worked so well on jade that the developers tried it on other types of rock and were thrilled with the results. 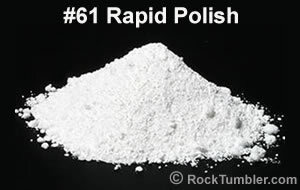 We use #61 Rapid Polish if we are tumbling fracture-free materials without cleavage planes in a vibratory tumbler. It is our favorite polish for Apache Tears and snowflake obsidian. It is also the polish that we use when polishing cabochons on a lapidary wheel covered with felt. It makes a super bright polish. How much to use? In rotary tumblers we use 2 tablespoons of TXP polish per pound of material (rocks plus ceramic media) in the barrel. In vibratory we use 1/2 tablespoon of either TXP or Rapid Polish per pound of material in the bowl. We don't use Rapid Polish in rotary - it was designed specifically for vibratory. Preparation for polishing: Most people go straight from fine grit (500 or 600 grit) to TXP. Some people who use #61 Rapid Polish do an additional step with 1000 grit. We don't use 1000 grit in our everyday polishing, but if we were tumbling for a special project we might use it. How long to polish? We run TXP for one week in a rotary tumbler. When using TXP or #61 Rapid Polish in a vibratory tumbler we run for one day, check the polish, and continue if we think it can be improved. Most of the time we polish in these aluminum oxide compounds for 48 to 72 hours. We rarely go beyond 48 hours - when you start polishing longer amounts of time the bruises and chips will start adding up and any stray abrasive particles in the barrel will start working against you.